Sinobaler has developed a baling machine specifically designed for steel drums / steel barrels of almost any size (up to 55 gallons, which is about as large as they get). 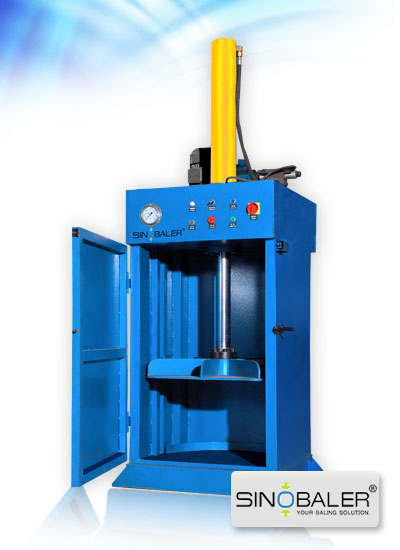 Our drum crushing machine / barrel crusher is a long-stroke, vertical baling machine that can crush a steel drum in about a minute (using 30 tons of force). And because it is specifically made for this task, it has features to make the job easier. For example, there are spikes built into the platen to puncture the drum (this allows air in the drum to be released); and the baler can also drain the remaining liquid (this is for containers that housed liquids, obviously). So crushing becomes easy, and the drums can be easily transported and sold for scrap. Why you need a barrel crusher? Steel drums and steel barrels have become one of the most popular shipping containers in the world. Introduced in the early 1920’s, these containers replaced the previously used wooden barrels, and caught on quickly. For shipping purposes, steel is stronger, more sanitary, and better able to withstand the rigors of worldwide shipping. Today, you can find many products shipped via steel drums. If it can be poured, it very well may find its way into a steel drum. This includes the obvious liquids, like chemicals, oil, solvents, paint, and similar; but also unconventional products, like flour, grains, and cereal. Again, liquid or solid, if it’s poured, a steel drum makes for a fine container. However, this efficient method of shipping is not so efficient once the product is used. Steel drums are typically large, and take up a lot of space. They are unwieldy to move, and an inefficient use of space. Unless they are immediately shipped out, steel drums can quickly become a problem. The solution is to compact them and our steel barrel crusher is the right machine in this case. So if compacting steel drums is of interest to you, please contact us today and we’ll discuss how we can provide the best solution for you. View more PROSINO drum or barrel shredders for further size reduction purpose.